"Ever wondered what to do with that last little bit of marinara sauce or those broken lasagna noodles? Well, I've got you covered! 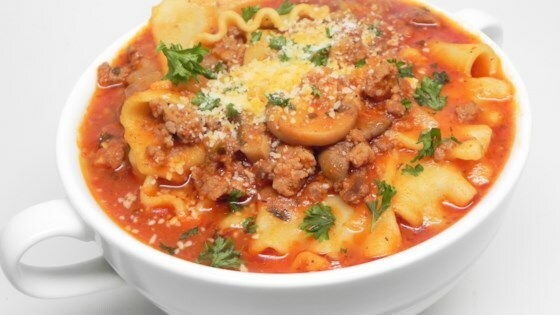 This soup has all of the flavors of lasagna without all of the hours in the kitchen. I've made it with fairly simple ingredients but feel free to add ground fennel seeds or herbs." Turn on a multi-functional pressure cooker (such as Instant Pot(R)) and select Saute function. Add sausage and ground beef to the pot and until browned, about 5 minutes. Drain and discard grease and set meat aside. Add olive oil and swirl to insure the bottom of the pot is evenly coated. Add onions and cook until just soft, but not brown, about 5 minutes. Stir in garlic and cook until just fragrant, about 1 minute. Pour in chicken broth and deglaze the pot, scraping up the brown bits from the bottom. Pour in marinara sauce. Add meat mixture and season with salt and pepper. Stir to combine. Add lasagna noodles, making sure that they are completely submerged in sauce. Close and lock the lid. Select high pressure according to manufacturer's instructions; set timer for 3 minutes. Allow 10 to 15 minutes for pressure to build. Release pressure carefully using the quick-release method according to manufacturer's instructions, about 5 minutes. Unlock and remove the lid. Taste and adjust salt, if necessary. Ladle into bowls and top each with 1 teaspoon Parmesan cheese. Quick-method comforting chicken noodle soup! I use the Instant Pot® marinara sauce recipe from this site, it has lots of flavor. Please don't leave out the cheese, it's what makes the soup tasty. This is best served fresh, as the noodles will absorb the liquid in the soup if stored. Very tasty! Didn't have lasagna noodles so used elbow and added some red wine. Family loved it and plenty for leftover lunches. No changes, will be making it again.